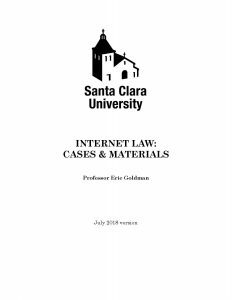 I’m pleased to announce this year’s edition of my Internet Law casebook, Internet Law: Cases & Materials. 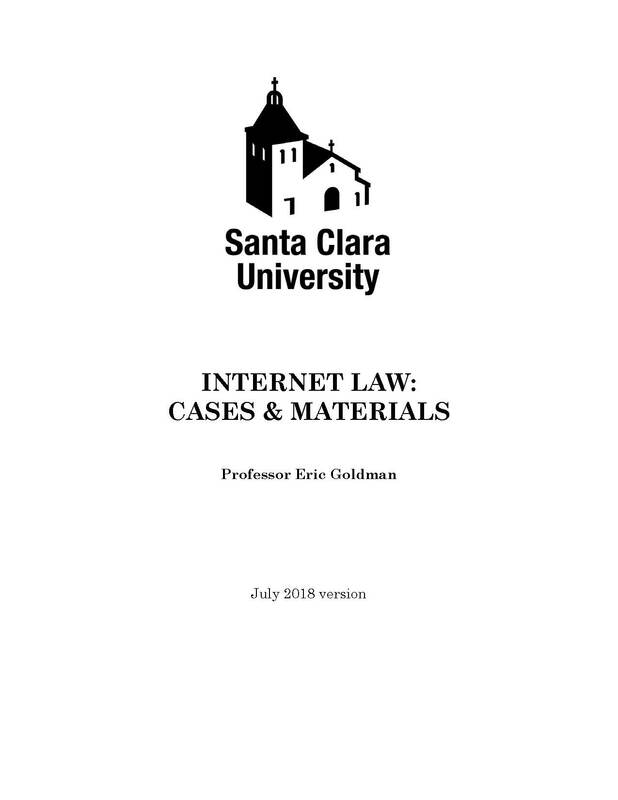 It’s available for sale as a PDF at Gumroad for $10, as a Kindle book for $9.99, in hard copy at Amazon for $24 + shipping, and in hard copy and editable electronic formats from LawCarta. For my thoughts about self-publishing an ebook casebook, see this article. 1) I replaced Specht v. Netscape–a casebook stalwart for a dozen years–with Meyer v. Uber. This was a tough decision because the Specht case had significant pedagogical value. However, the Second Circuit has issued a number of online contract formation rulings in recent years, and using Meyer v. Uber case allowed me to skip some of the intervening jurisprudential drama/confusion. Plus, Meyer is a mobile device case, which freshens up the chapter and is perhaps a little more millennial-friendly. Because the book’s contracts discussion was tied closely to Specht, I reworked the entire online contracts chapter. I’m so pleased with the results that I posted the entire chapter to SSRN as a free download. 2) For the first time (remarkably), I added a primer on Section 230. This primer, and the comparison between Section 230 and other countries’ rules, will eventually find its way to SSRN. 3) I added a module on FOSTA. I burned through a lot of Kleenex tissues and brain cells writing it. 4) I added a primer on GDPR. Writing it was a miserable week of my life that I’ll never get back. 5) I added a primer on the California Consumer Privacy Act. More Kleenex and dead brain cells. I’ve also posted this primer to SSRN. I also made dozens of smaller changes throughout the book, especially to the DMCA section. Altogether, the book grew nearly 10% this year. As an experiment, this year I added Prof. Jonathan Zittrain’s case study on Facebook’s contagion experiment to the course as a short writing exercise. I’m curious how students respond to the case study. Manipulating Facebook users’ moods seems almost quaint in comparison to Facebook’s role in the 2016 elections and beyond! I. What is the Internet? Who Regulates It? “I added a primer on GDPR. Writing it was a miserable week of my life that I’ll never get back.” LOL.